SAIN Forum 2018 was held in the UK in 8-10 October. The theme of SAIN Forum 2018 was knowledge sharing and mutual learning – supporting the green development in agriculture in the UK and China. SAIN Forum 2018 was organised by SAIN Secretariat (UK) in partnership with the Rural Energy and Environment Agency (REEA) of the Chinese Ministry of Agriculture and Rural Affairs (MARA). The Chinese delegation, led by Mr Gao Shangbin, deputy director general of REEA, included the members from REEA, National Animal Husbandry Services, the Agri-Environment Protection Institute, and UNDP (China). 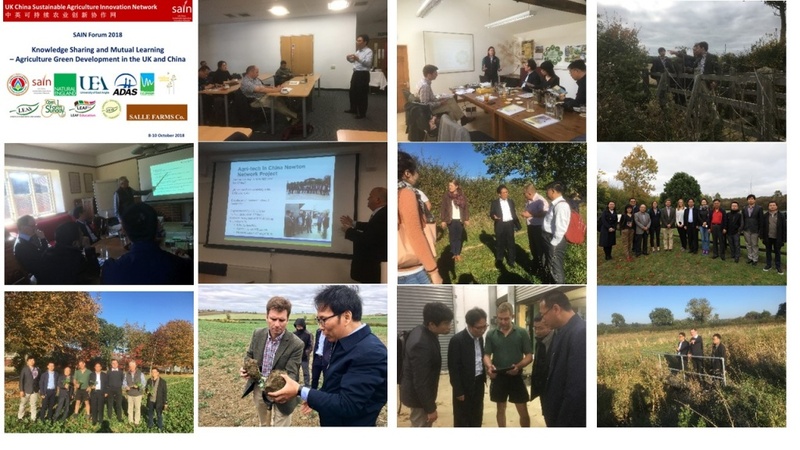 The UK collaborators of SAIN Forum 2018 included Natural England, UEA, ADAS, LEAF, Wensum Alliance, Farrington Oils Ltd (Bottom Farm) and Salle Farms Co.
Mr Gao Shagbin delivered the key note on China’s eco-agriculture development and highlighted the priority areas for further cooperation between the UK and China. Ms Alice Midmer of LEAF, Ms Hannah Thacker of Natural England, Dr Ji Zhou of Earlham Institute , Dr John Williams of ADAS and Dr Brian Reid of UEA delivered key note speeches respectively integrated farm management, agricultural ecosystem conservation the in UK, AI and application in agricultural resource management, improved manure and nutrients management and soil amendment by biochar. Dr Yuelai Lu, Head of SAIN Secretariat (UK), said the Forum was an excellent event for knowledge sharing and mutual learning between Chinese and UK agricultural officials, advisers, farmers and academics in the meeting rooms and in the field. We look forward to facilitating more mutual learning events to support the agriculture green development in both countries.